Drift Kings társasjáték - Magyarország társasjáték keresője! A társasjáték érték! A Drift Kings egy remek társasjáték, 2 - 6 játékos részére, az átlagos játékidő 1.5 óra. A társast, 9 éves kortól ajánljuk kipróbálni. A játékmenet erősen épít a darab elhelyezés, a moduláris tábla, a szimuláció és a megtervezett körök/akcók mechanizmusokra. Feel the thrill of racing like never before with Drift Kings, a fast paced racing board game for 2-6 players featuring the exciting world of drift racing. Unlike most other racing games, Drift Kings simulates the feeling of driving a car using a completely innovative movement mechanic called the TrajecTile system. On a player’s turn, they use a uniquely shaped set of tiles, TrajecTiles, to plot their car’s movement on the track. The tiles represent the gears of a car, 1 through 5. The higher the gear, the further the distance the car moves. The special shapes at the ends of the tile mean that each tile can pivot in the previous tile to simulate steering. The lower the gear tile played, the further it is able to pivot in the previous tile. So, in first gear, although the car is not moving very far, it has the most maneuverability, while in 5th gear, the car is moving quite far but has the least maneuverability. Five tiles are played each turn, one after the other, and players must chain through the gears like in a real car. Each tile must be followed by a tile that is either the same gear, or one gear higher or lower than the previous tile. So, a 3rd gear tile can be followed by a 2nd, 3rd or 4th gear tile, but not a 1st or 5th. This has the effect of simulating different handling characteristics at various speeds and, as the tiles must be chained together, simulates acceleration and braking as well. Once 5 tiles have been played, their car is moved to the end of the last tile and the next player takes their turn. There are two special types of tiles in the game and it’s here that drifting comes into play. The first is a handbrake tile, which is used to start a car drifting. A normal gear tile cannot fit into a handbrake tile. A handbrake tile must be followed by one or more drift tiles. The unique shape of a drift tile means that they fit into the corner of a previously placed tile. They can be pivoted in a previous tile, like a normal tile but, if rotated all the way, may also be “slid out” along their flat side to “feather” the drift. 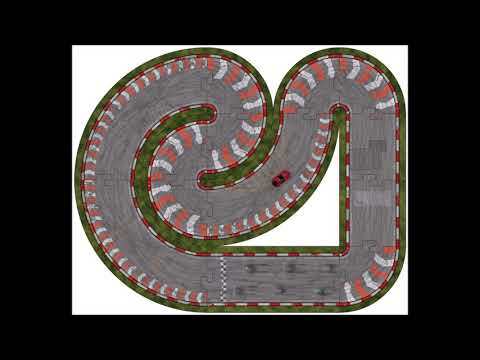 Drifting, if done in special Drift Zones around the corners of the track, will earn players Edge Points. These points can be used on subsequent turns to break certain rules of the game. For instance, Edge Points can be spent to “Powershift”, allowing players to skip up and down gears. i.e. Jumping straight from 1st up to 5th gear or vice versa. There are, of course, more rules to the game but that should be enough to give you an idea of how the TrajecTile system works. In addition to a full set of TrajecTiles, Drift Kings features 6 highly detailed plastic car miniatures and a set of modular track sections for unlimited replayability as well as player boards with gearshifts to track player’s Edge Points and gears from turn to turn. A set of cards to track race positions and reference cards for the various “special maneuvers” that players can purchase with Edge Points earned through drifting are also included along with sand timers to time the players turns.